PS Kingswear Castle was built in 1924 by Philip & Son of Dartmouth and sailed up and down the River Dart until the 1965. She has a coal fired steam engine built by Cox & Co of Falmouth. 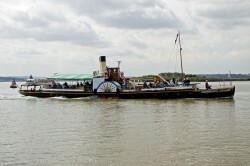 After withdrawal from service she was bought by the Paddle Steam Preservation Society and operated for a few years at Binfield on the Isle of Wight before being moved to the River Medway, for restoration. She returned to service in 1985, since when PS Kinswear Castle has carried more than 200,000 passengers on excursion from bases at Chatham and Rochester and on the Thames. Running and maintaining a coal fired historic paddle steamer is expensive and much work has to go in winter to maintain Kingswear Castle to the rigorous standards demanded by the Maritime and Coastguard Agency for the re-issue of her Passenger Certificates each season. Over recent years the work has included the installation of a new boiler, new paddle boxes, new sponsors and much more. PS Kingswear Castle is now operating from her original home on the River Dart. PS Kingswear Castle operates excursions, cruises and private trips throughout the summer. There are two saloons below deck and there is a bar and buffet serving tea, coffee, wines, beers, snacks and other light refreshments. This relaxing tour starts and ends in Dartmouth and passes Bayards Cove, Warfleet Creek, both Dartmouth & Kingswear Castles, Britannia Royal Naval College, Noss boatyard, the quaint village of Dittisham and the Greenway Estate, former home of the late Dame Agatha Christie. Kingswear Castle is run in association with the Paddle Steamer Preservation Society, a registered charity. All revenue from her sailings is ploughed back into her continued operation and long term preservation.